Application Insights has been around for a while now and after a while I was wondering if there was a integration within Visual Studio. Open Application Insights: Opens the application insights screen within the Azure preview portal. 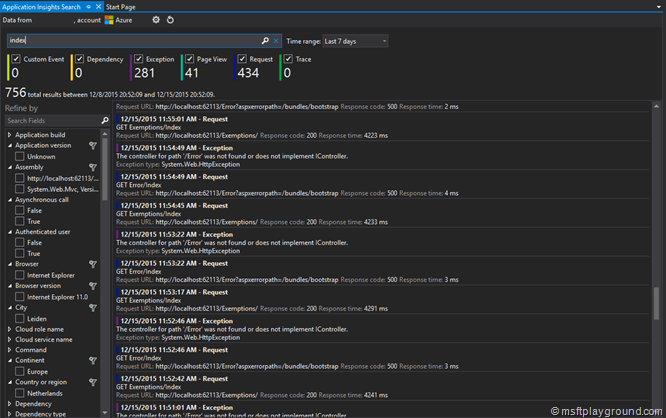 Configure Application Insights: Opens the application insights configuration screen within the Azure preview portal. 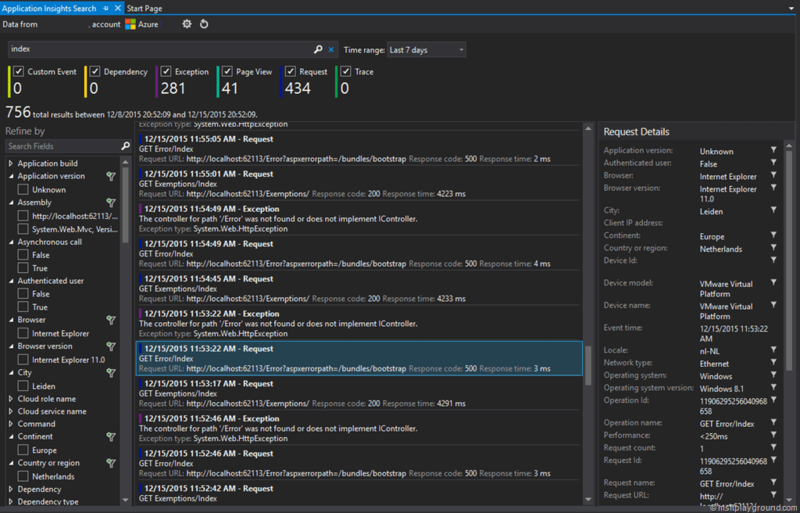 Search: Opens a integrated window within Visual Studio to search trough events within Application Insights. 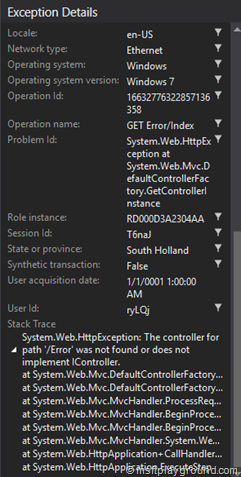 Untill today I was only aware of the first two options maybe upgrade 1 of Visual Studio 2015 added the search functionality. The update I received today made me wondering what the integration within Visual Studion 2015 is. 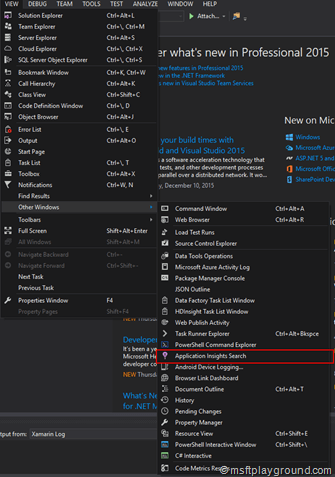 The “Search” option can also be found within the “View” menu under “Other Windows” and then “Application Insights Search”. When the window opens it will try to make a connection to an Azure account and you will get the option to select an Application Insights application. After you made you choice your are able to search and select a specific time frame to search in. When you perform the search it will give you a list of results. On the left side of the screen you can further drill down into the results by the different properties the events contain. By selecting a specific event a detail view will be added in the window. This view will include all neccesary information regarding the event. The details window will also include a lot of information about exceptions. The information shown in the integration is really fantastic specially if you are looking for specific events. 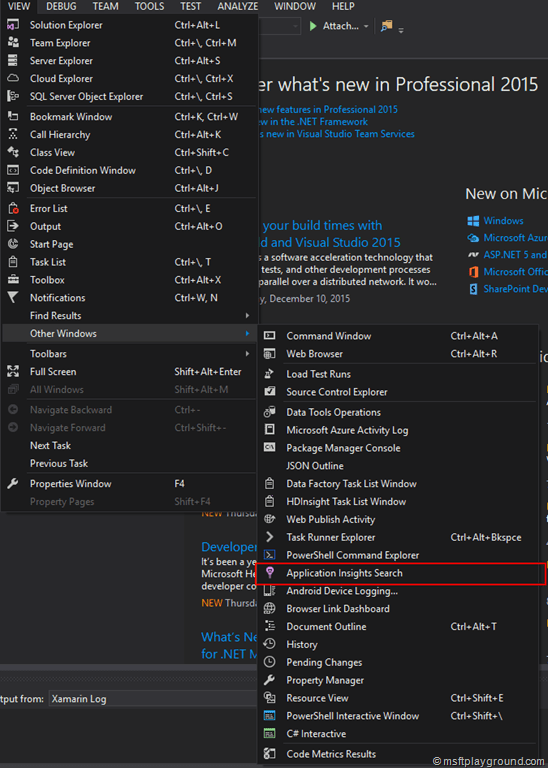 Another great point about this integration is that you do not require to switch windows when developing a application that is using application insights.